The main building blocks of the proposed work and their interactions are demonstrated below: each WP has its own core of tasks, but these tasks both allow and demand for close interactions between WPs. 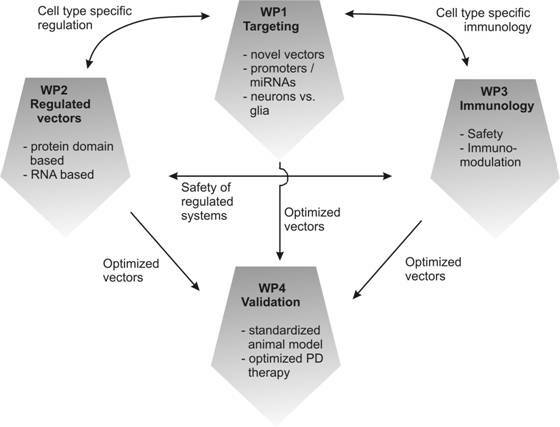 All WPs will generate important improvements in CNS vector technology on their own, but only close interaction, timely dissemination, discussion and implementation of WP-specific results will ensure development of optimal gene transfer systems, allowing for safe, efficient, long-lasting, targeted and regulated gene transfer to specific CNS structures. For example, transgene expression from novel vectors restricted to glial cells may provoke different immunological consequences than neuron-restricted transgene expression, especially under disease conditions, and both efficacy and sustainability of the different regulated expression systems may be critically influenced by targeted cell types. Thus, the highly interactive structure of the consortium will make sure that these important issues are solved in a timely fashion.